Unleash the power of serial data analysis to understand and characterize your design, prove compliance, and determine why a device or host fails compliance. But how do you determine why a device fails compliance? 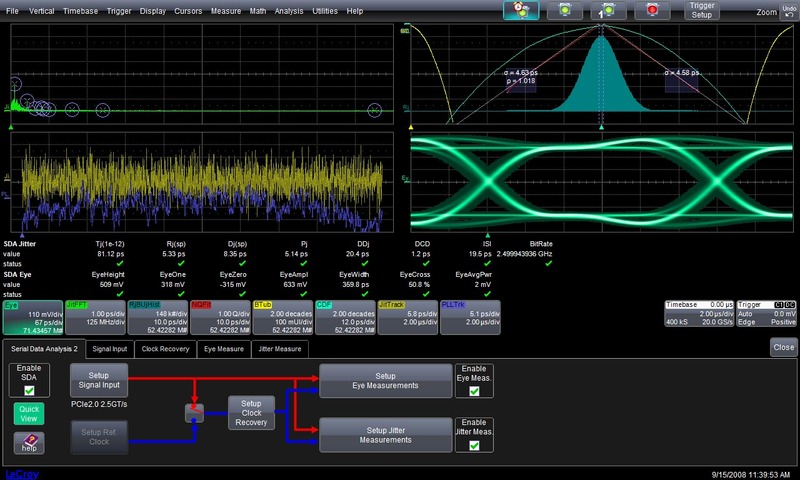 Teledyne LeCroy’s SDA II serial data debug software is the most powerful and versatile solution for finding the root cause of serial data compliance failures. SDA II provides the confidence you need to ensure proper functionality. The SDA II analysis package is the only solution that fully integrates jitter measurements into the oscilloscope software leading to greater confidence in jitter measurements. New features such as IsoBER add insight to the traditionally non-quantitative view of eye openings, while Dual-Eye View Modes and the ability to Show Mask Failures help you to quickly identify sources of eye failures. In addition, properly distinguishing between the Rj and Dj in a serial data signal is a crucial part of reducing overall jitter. For example, the Periodic Jitter Spectrum allows the user to accurately identify the frequencies where periodic jitter (Pj) occurs and the DDj Histogram displays the distribution of the Data Dependent Jitter (DDj). 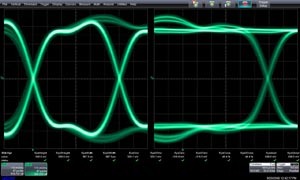 These new features provide the highest level of insight into possible jitter sources. 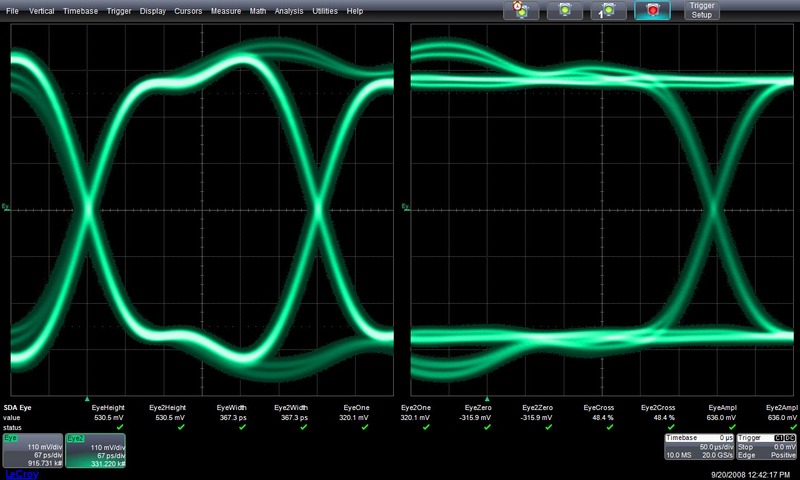 Viewing the transition and nontransition eye diagrams allow for analysis of de-emphasis in serial data waveforms. In addition, the Dual-Eye Gated mode or view enables the creation of two separate eyes based on two separate signal inputs (i.e. Read/Write). Mask failures can be highlighted with red circles showing the exact points where the data intersects the mask. Additionally, the number of these failures is available as a parameter, which is useful for automation. Masks for many standards are included, and can be stretched vertically and/or horizontally to provide testing with margin. 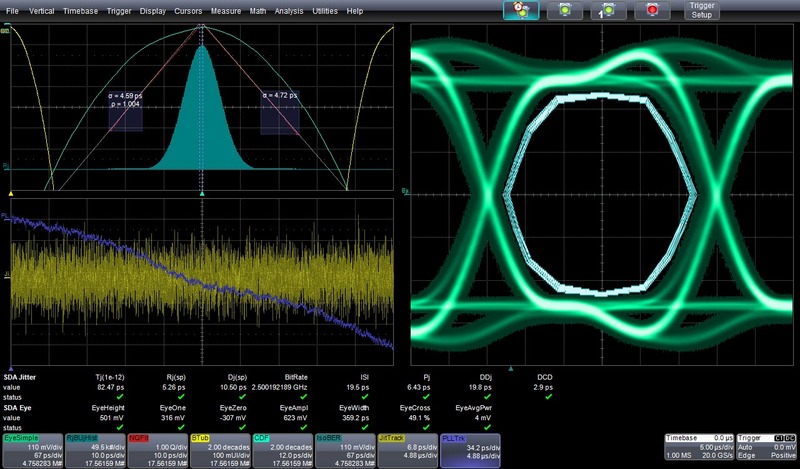 Mask testing is not always the best way to determine if the signal meets Bit Error Rate requirements because it lacks quantitative analysis of vertical noise and jitter. Teledyne LeCroy’s unique IsoBER analysis tool provides quantitative analysis by extrapo lating the eye diagram data and displaying the lines of BER directly on the eye. This helps to quickly determine the minimum eye opening and is instrumental in detecting cross-talk by analyzing the vertical eye closure. These measurements are not possible with standard eye diagram techniques. The sources of jitter can be categorized as Deterministic or Random, which is an important distinction in calculating the Total Jitter (Tj) of a signal. There are cases where cross-talk, or other types of Dj, can masquerade as random jitter and cause incorrect calculations. 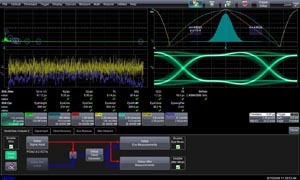 Teledyne LeCroy’s integrated SDA II jitter analysis offers two decomposition algorithms accounting for these situations. 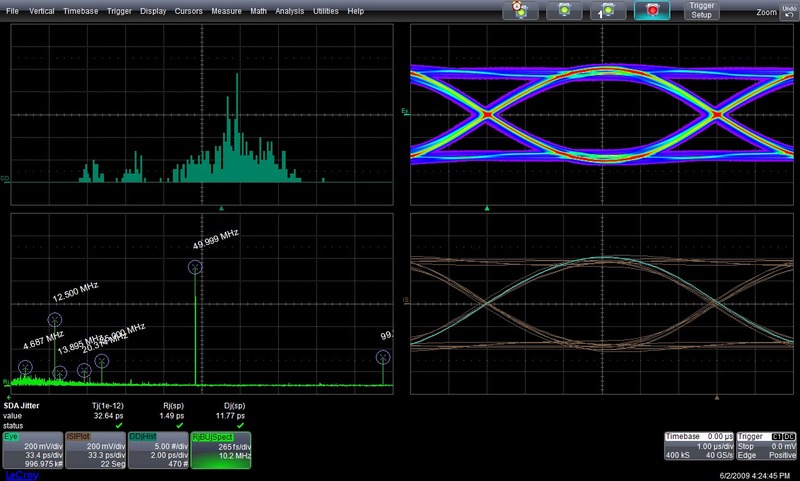 These algorithms provide confidence that all jitter components are accurately recognized and processed correctly. Jitter decomposition calculates both methods simultaneously and alerts you when there is a deviation between the results. 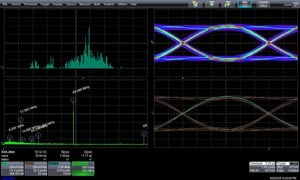 Teledyne LeCroy’s SDA II Serial Data Analysis provides intuitive views of jitter decomposition for fast root cause insight. Periodic Jitter Spectrum identifies the sources containing the highest value of Pj. Eye Diagram displays a visual representation of the total jitter (Tj) of the system. ISI Plot ISI Plot isolated bit patterns that contribute to the most Intersymbol Interference (ISI). Green / Yellow / Red setup warning indicators alert when something requires your attention. For example, if the input signal is a clock and you have not selected clock as the signal type, a yellow indicator informs you that setup inconsistencies may require attention. The SDA II analysis package is the only solution that helps you identify the cause of problems, to help you solve problems quickly. 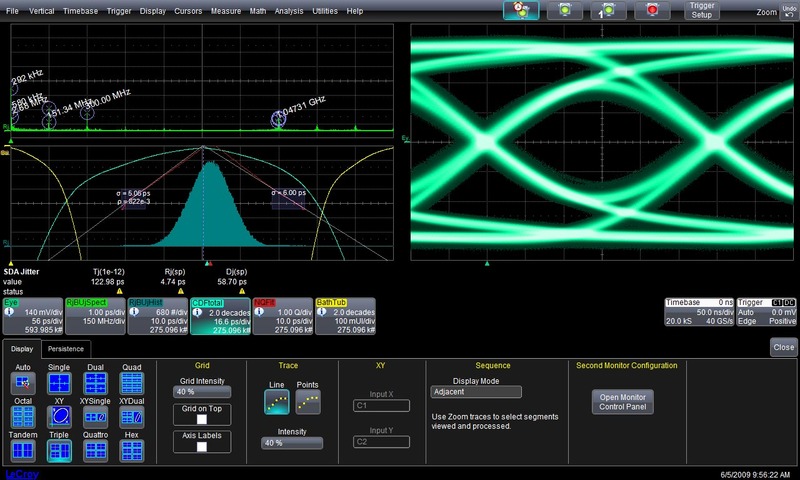 Eye and jitter analysis in the SDA II or SDA 7 Zi begins with a simple, interactive flow diagram that intuitively guides you through the setup of Eye Measurements, Jitter Measurements, or both at the same time. SDA II has the ability to display all of the eye parameters and jitter parameter at the same time while simultaneously displaying the standard measurement table. All of the pertinent measurements can be displayed on one screen to allow for faster debugging. The ISI plot shows data-dependent jitter contributions to the eye pattern for the second-to-last bit of a bit length, set from 3 to 12. This plot is based on averages of bit patterns and therefore provides a view of the eye diagram without any noise on the signal. 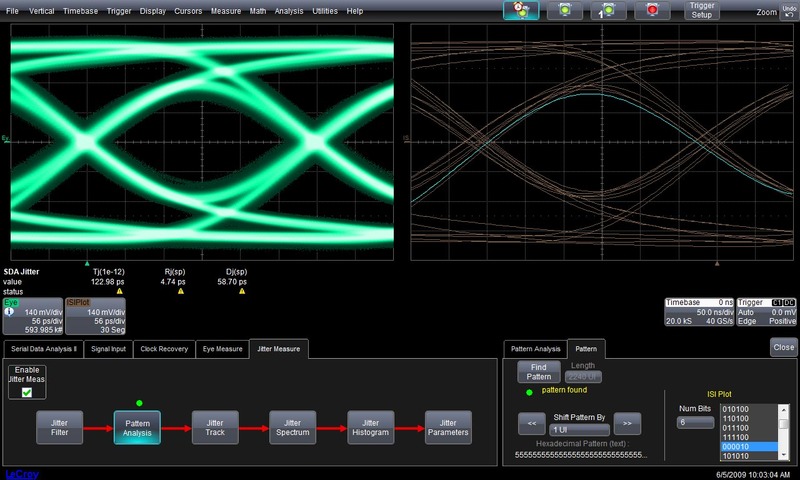 SDA II provides unique display modes that allow maximum flexibility in the positioning of the eye diagram and jitter analysis plots. This allows you to put what you want where you want. 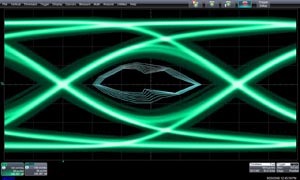 A complete toolset is provided to measure total jitter. Eye Diagrams withmillions of UI are quickly calculated from up to 512 Mpts records, andadvanced tools may be used on the Eye Diagram to aid analysis. 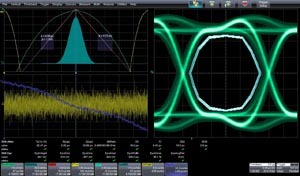 CompleteTIE and Total Jitter (Tj) parameters and analysis functions are provided. Two jitter decomposition methods are provided and simultaneously calculated to provide maximum measurement confidence. 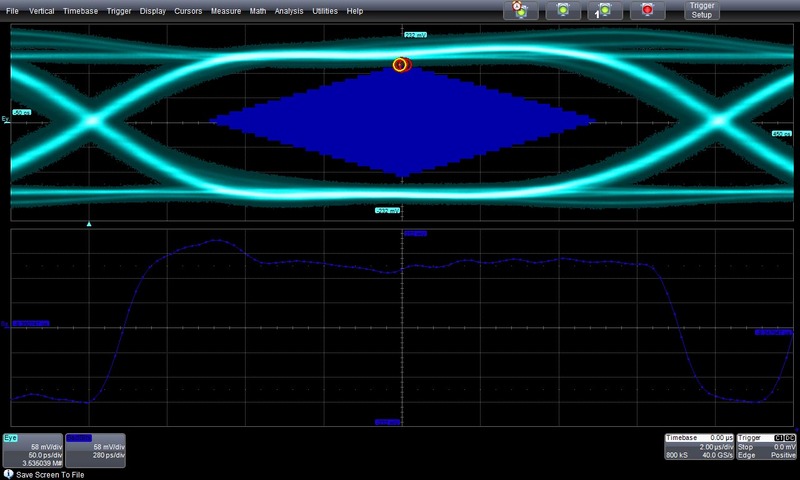 Q-Scale, CDF, Bathtub Curve, and all jitter decomposition measurement parameters can be displayed using either method.